The Triennale Design Museum, presented "Message on the bottle", a project of OnDesign, the design and communication agency headed by the Italian-German designer duo Francalma Nieddu and Olav Jünke. They invited their designer friends around the world to put a personal message on the bottle as a label or in any form they liked. The resulting works had been presented to the public at the Triennale DesignCafè in Milan on bottles of biodynamically grown Barbera and gave wines from Piedmont's La Raia wine cellar, after winning a European Design Award in Stockholm with their "wine for you" design, an emblem of the exibiion. The design is a modern reinterpretation of the message in a bottle theme, featuring not a letter, but a fine wine. 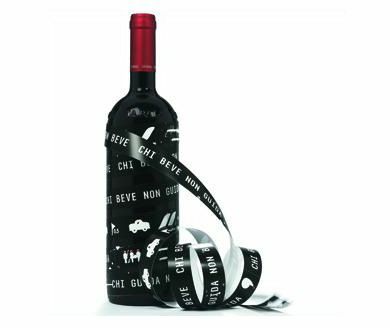 In "Chi guida non beve, chi beve non guida" project, a ribbon is softly winded around the bottle and quote the slogan "Drivers don't drink, drinkers don't drive".